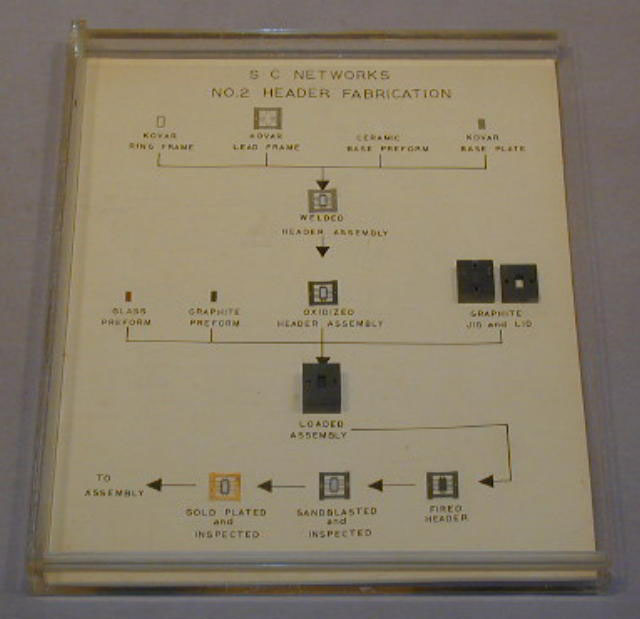 Displays step by step fabrication of the second production version of the 1/4" x 1/8" IC flatpack. The header has a kovar base plate stitch welded to the lead frame. The lead frame was sealed to the ring frame with glass frit. For final seal, a kovar lid was stitch welded to the ring frame. Production in this package was started in early 1963. Although refinements in the design were made from time to time, it remaind the basic flatpack and was used for many special transistor and diode applications as well as IC's.